How to remove difficult spots at home. Uchshie funds from stains - advice housewives. How to quickly and easily bring tight spots at home - valuable advice. Getting rid of fat stains, blood, ink, tea, berries, etc. together! 1. The spots, which are dissolved in water. It stains from foods that contain sugar, spots of wood glue of water-soluble salts of certain water-soluble dyes. 2. The spots that appear organic solutions. It stains from grease, motor oil, varnish, resin, oil paint, wax, cream, shoe polish. 3. 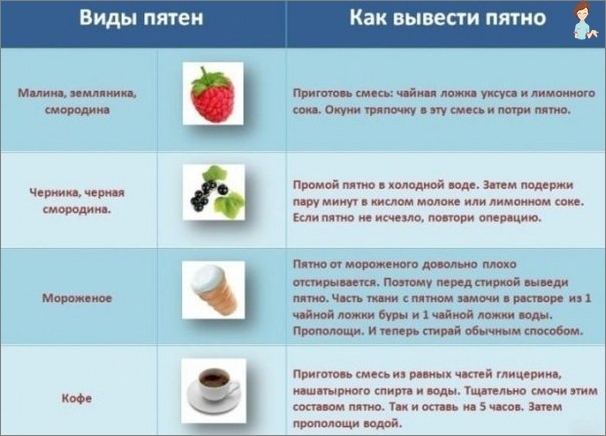 The spots, which do not dissolve in water and organic solutions. 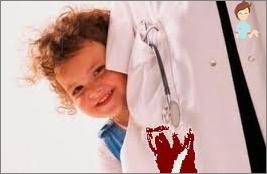 Fatty stains paint from tannins, from water-insoluble natural and artificial dyes, proteins, blood, pus, urine, mold. Each type of stains require special treatment. 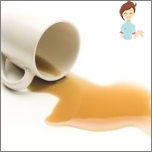 Some stains, such as coffee, fruit juice, wine, requires treatment as a means of water-soluble stains, as well as means for insoluble stains. • The chemicals that you use to removestains are best pre-tested on a trial piece of fabric, the seams on the filing or stocks. Not recommended for highly concentrated solutions. 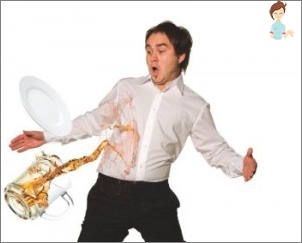 Better to treat the stain several times with a weak solution, successively washing the cloth with water. 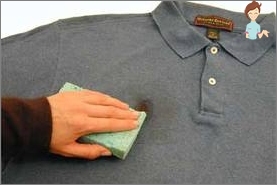 • Before removing stains fabric should be cleaned of dust, at first dry, then wet brush. • Spot the following conclusions from the inside out, placing it under the white paper or cloth, you can also use a plate, wrapped in white cloth. • Clean the stain best with a cotton swab or a soft, white cloth. To begin to moisten the area around the spot, then very wet stain from the edge to the middle, so it will not fade. 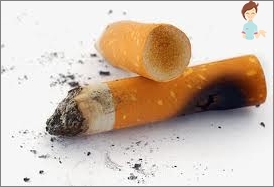 • Stains of unknown origin are best display solution of ammonia and salts. How to recognize the kind of stain? • Fresh stains are best removed by washing the fabricwater, first cold several times, and then goryachey.Dlya successful stain removal is very important to know what is its origin, but at the same time is important and the composition and characteristics of the tissue. grease stains typically do not have clear boundaries. Fresh grease stains are always darker than the fabric itself. The old grease stains lighter and acquire a matte finish. They are deeply absorbed into the material, and even appear on the reverse side tkani.Eto helps you to easily cope with the stain or damage your favorite thing. If you do not know the material, the cut a small piece of tissue from the area of ​​the seam and check means for spots on it. Spots containing no fat. Stains from berries, beer, juice, tea, wine, and others. They have clear boundaries and contours of the darker spots themselves. Spots containing the fatty substances and non-greasy. There are more than others. These stains typically remain on the fabric surface only and they contain fats penetrate deeper. It stains from milk, blood, soup, sauces, street dust. Oxidized spots. The spots that appear on the site of the old spotsunder the action of light, oxygen and other factors. This is the most trudnoustarimye spots. 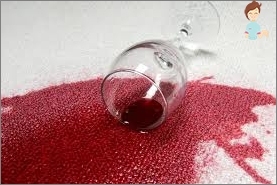 Stains from berries, fruit, mold, wine and coffee are usually oxides property. How to deduce stains from dirt? For stain removal of dirt is best firstclean the area with a brush. When the fabric dries wash off the stain with warm soapy water. 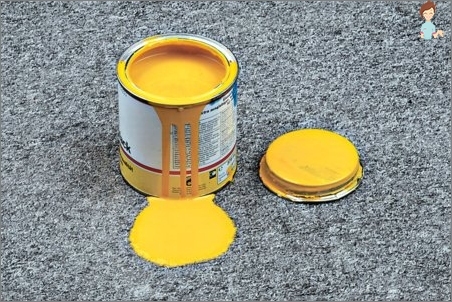 If the spot does not leave, it should be dipped in strong vinegar solution. If contaminated thing can not be washed, the stain should be derived hydrogen peroxide. With cloak best stains can be removed with a cotton swab moistened with vinegar solution. How to bring a spot of oil paint? Spot of oil paint is wiped with a cottonswab dipped in turpentine or guardsmen. If the color of the fabric is not changed, the spot can be displayed with alcohol. Spot gasoline soap also possible to deduce from oil paint mixed with turpentine in a ratio of 1: 1. If the stain is old, it's worth it, first moisten with turpentine. After the paint clean off it gets wet with a solution of baking soda and rinse thoroughly with warm water and cloth. Stains from oil, sprats and other canned food oil can be easily removed using kerosene. 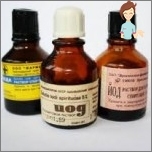 After treatment, paraffin tissue, it is desirable to wash with warm water and soap. 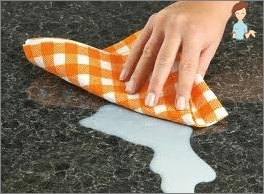 A very common way to remove grease stains with chalk. Spot sprinkled with powdered chalk, firmly pressed against the tissue and allowed to stand overnight. In the morning, clean cloth brush. The spot disappears. Spot of fish oil can be removed with a solution of vinegar. Greasy stains on dense synthetic tissuesAre best removed using potato starch. Put the starch on the stain, and then rub it with a warm wet towel. When the starch is dry, clean the cloth with a brush. If the stain does not come out completely, repeat the procedure again. Stains from eggs should be removed immediately, sinceThen they create insoluble compounds that are no longer susceptible to excretion. Fresh stains from eggs are removed with ammonia, old glycerin and ammonia. If the stain is not a white cloth and it is larger enough, it is best to wash it off immediately with warm soapy water and rinse. If the fabric is colored, then to remove the stain is betterJust use a mixture of 2 spoons of glycerin, 2 spoons of water and a couple drops of ammonia. Spot should be moistened with this mixture, put between two cotton fabrics and iron iron. With colored woolen fabrics, the stain is removed with the help of glycerin heated to 35 degrees. It is applied to the tissue for 10 minutes, and then washed off with soapy water. Spots of chocolate is enough to wipe ammoniaalcohol and then rinse heavily salted water. If chocolate soiled white cloth, then you can remove the stain with hydrogen peroxide. She needed to soak the soiled place and leave for 10-15 minutes, then rinse with cold water. Spot from coffee and strong tea is removed with a brush moistened with warm water. The tissue is then thoroughly washed with warm soapy water. And rinse light vinegar solution. On such spots deduce heated glycerin bright cloth fabric. Lubricate stain them, and after 20 minutes, washed with warm water and dried with a towel. With such a spot color output by productglycine mixed 1: 1 ratio with egg. Another such stains can be removed by using a slurry of table water, apply it on the spot, and after half an hour wash with soapy water. Then rinse with warm water. 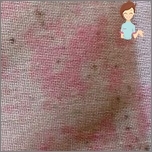 Spots of red wine can be removed with a solution of potassium permanganate, moistened her blurred spot, and then treating with hydrogen peroxide. With white fabrics such stains should be removed withusing a solution of 5 g soap and 0.5 tsp soda and water glass. Apply the solution onto the stain and leave it for a day. Then rinse thoroughly with warm water. This spot can still scrub a piece of ice. Beer spots are best displayed with soap and water. Inveterate beer stains can be cleaned with a mixture of glycerin, wine and ammonia in equal parts. The mixture was mixed with water in a ratio of 3: 8. Fabric with bloodstains washed with cold water first, then with warm soapy water. Before washing, better soak for several hours. Inveterate stains first rub the solutionammonia, and then the solution will then wash the laundry in warm water. With thin silk products are removed by the blood starch zameshennogo slurry in cold water. Take off those spots giposulfata solution. Purified place then washed with warm water. With silk fabrics such stains derive a solution of denatured alcohol and ammonia in a ratio of 1: 1. Spots with a woolen cloth is removed with a cloth dampened with a strong solution of salt. If the stains are still visible, then wiped with alcohol. Stains from perspiration and fade if washed in the water a little ammonia. Teaspoon per liter of water. The fabric is washed in soapy water with ammonia. Such spots are well displayed serum or yogurt. Wet serum contaminated area. Stains from iodine should fill up with soda, pour vinegar on top and leave overnight. In the morning, rinse with clean water. You can also use potato starch and rub them to remove the stain of iodine stain until it disappears. Then wash cloth and soap. Inveterate iodine stains should be derived from the starch gruel and water. Such spots are displayed well with lemon juice. Wet the stain with lemon juice and then proutyuzhte soaked land. Then again wet land with lemon juice and rinse with water. With white rust stains fabric best output2% solution of hydrochloric acid. Lower tissue in acid and hold until you descend spots. Then rinsed in water with the addition of ammonia, 3 tablespoons per liter. How to bring the wax? Dried should first scrape off and then put on the spot of a clean cloth or paper towels and a couple of iron to iron until the stain does not come down. With plush velvet and wax should be removed with turpentine, but in any case not ironed. Spot on lipstick can be removed using borax. She poured the spot, and then rinsing the cloth in soap and clean water. 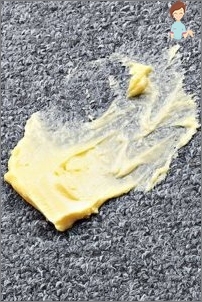 Stains from cosmetic creams removed with alcohol or gasoline. Spot on hair dyes removed mixture of hydrogen peroxide and ammonia. The spots of varnish removed with a cloth and acetone. Tedious to attach the napkin to the top spot and blot it with acetone. Continue like this until the complete removal of stains. These stains can be removed with denatured alcohol or vodka. Still it is possible for such purposes use table salt. After removing the stain, rinse the cloth with water. Fresh grass stain on the fabric can be washed with soapy water with the addition of ammonia. Remove by rubbing the stain with a mixture of egg yolk andmeth, a stirred until a thick creamy mass. Washed fabric warm and then hot water. You can also use warm glycine or denatured alcohol. With cotton fabric output by the chalk, which sprinkle the stain, the top lay a napkin and carried out several times with a hot iron. How to decorate an apartment for New Year?